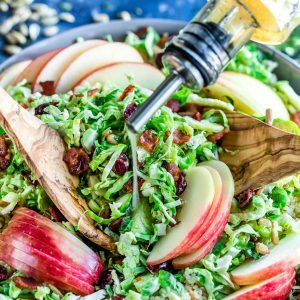 This Apple Cranberry Brussels Sprout Salad is drizzled with an easy homemade maple citrus dressing and sprinkled with with crunchy bacon and sunflower seeds! Make-Ahead + totally delicious! Ahhhhhh Brussels sprouts… My childhood nightmare turned adult obsession. It’s crazy how that works out, eh? It’s like someone legit flipped a switch on my tastebuds and made me go from OMGNOOO!!! to totally crushing on these tasty little cabbage balls. Lately my only dilemma is which way to serve them. Roasted and salted… blanketed with cheese… shredded into a scrumptious salad or slaw… I love them every which way! 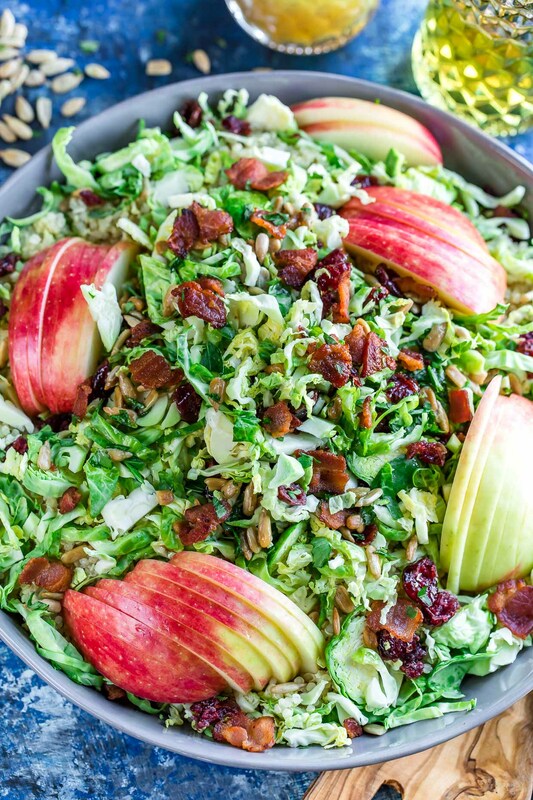 Today we’re going into full-fledged salad mode, because we all need a shredded sprout salad in our arsenal and it doesn’t hurt to balance out all those holiday cookies with a big green salad. The more salads we eat now, the more cookies we can snack on later. Yes? Yes! First rinse and drain your quinoa using a mesh strainer or sieve. While the quinoa cooks, chop and prep the remaining ingredients and whisk together your dressing by combing all dressing ingredients in a mason jar and shaking well. After rinsing, remove the stem/base from the sprouts. Next grab a sprout, cut in half lengthwise and lay each half flat on your cutting board. Thinly slice crosswise to create shreds. Repeat for each sprout. Once quinoa is ready, pop in the fridge to cool for a chilled salad or leave warm for a slightly warm salad, either option tastes great so choose your favorite. 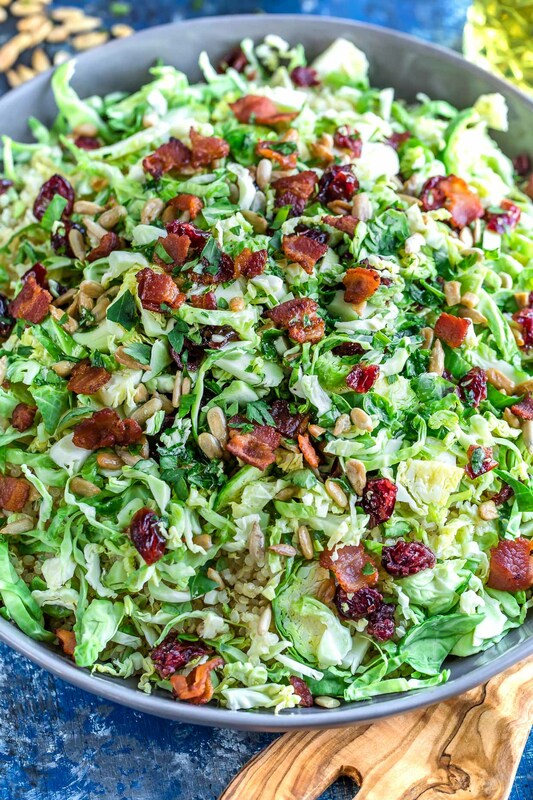 Combine quinoa, brussels sprouts and dried cranberries, along with half the bacon and sunflower seeds. Top with dressing and toss to coat. Sprinkle remaining bacon and sunflower seeds on top, as well as the optional feta if you're adding it. Season with any additional salt and pepper desired and dig in! See post below for vegetarian + paleo swaps + make-ahead tips and tricks. As with any salad, let this bowl of deliciousness be your base recipe. Start with the measurements above, then add extras of any of your favorites. For a touch of sweetness, try it with candied pecans or candied walnuts, both of which can be purchased or made at home in about 5 minutes. 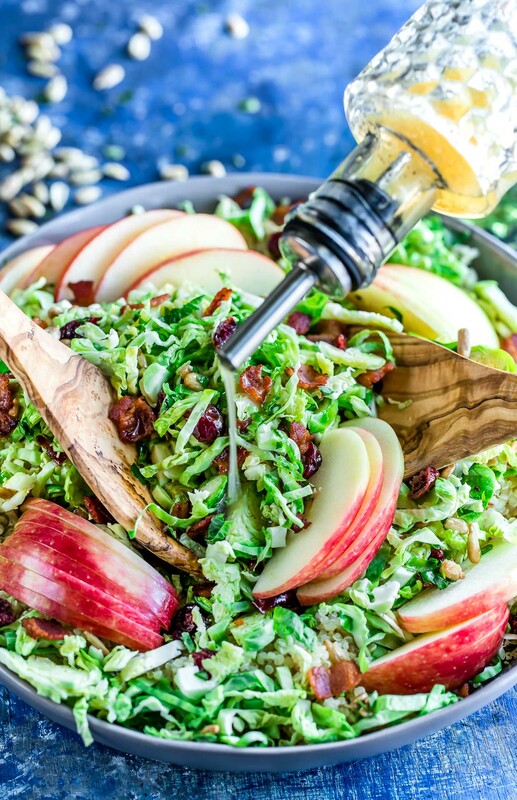 I feel like toasted chickpeas would also be nothing short of amazing on top of this shredded sprout salad! Try my Crispy Roasted Shawarma Chickpeas for an extra kick of savory spice — I’m totally adding a handful or three to the salad next time I make it. YUM! You can also add feta cheese or crumbled goat cheese on top if you’re feeling a little cheesy. I made one salad with feta and one without and they both rocked my socks. To make this salad gloriously VEGETARIAN, you can use the toasted chickpeas in place of the bacon (the smoked paprika on the chickpeas gives them a nice smoky flavor) or opt for vegan “bacon” bits which are soy based. I’ve even made faux bacon out of seasoned roasted wild mushrooms and flaked coconut, both of which are awesome options here if you’re a fan of either. LMK if you want me to post the recipe for them if it’s something new you’d like to try! 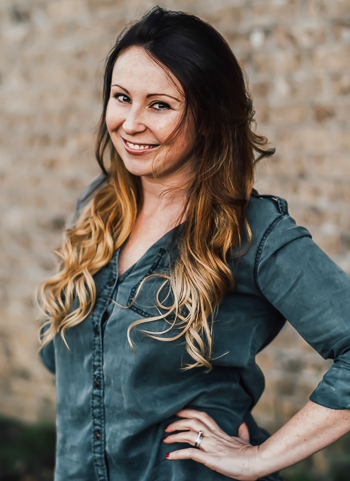 Need a PALEO swap? 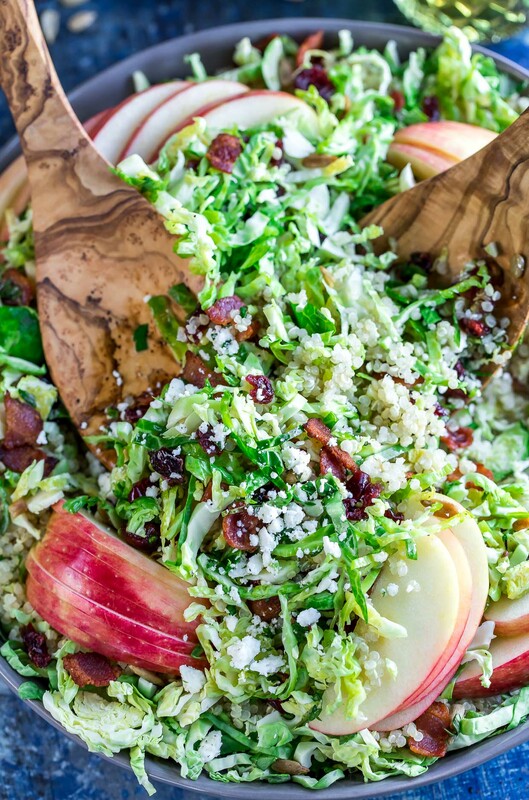 Replace the quinoa with extra shredded sprouts (triple the amount above) and skip the optional feta. Where are all my meal prep rockstars at? This salad can easily be prepped in advance and it also makes a stellar grab-and-go lunch option for work or school. Stretch your planning even further by cooking up a double batch of quinoa to keep in the fridge for salads and sides. Use some for this recipe, and the rest as a base for my Szechuan Shrimp and Broccoli, Greek Quinoa Bowls, or Cranberry Quinoa Salad with Candied Walnuts — all three are on heavy rotation around here! To make this salad ahead of time, you’ll basically toss all the salad ingredients together and store it in an airtight container or baggie in your fridge. The dressing can be whipped up in a mason jar and stored beside the salad right in the jar, so when you’re ready to dig in all you have to do is shake up the dressing, pour it over the salad, then toss the two together – easy peasy! 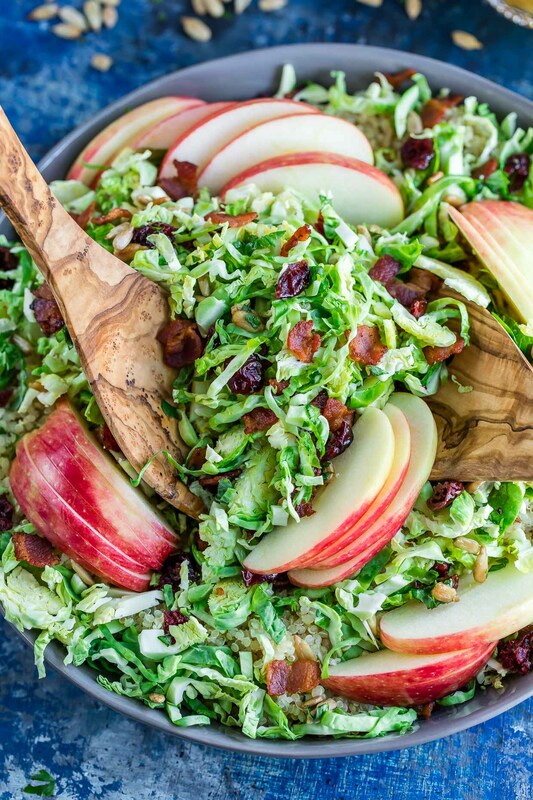 If you get a chance to try this Apple Cranberry Brussels Sprout Salad, let me know! I made a similar recipe recently, but mine didn’t have bacon… yum!